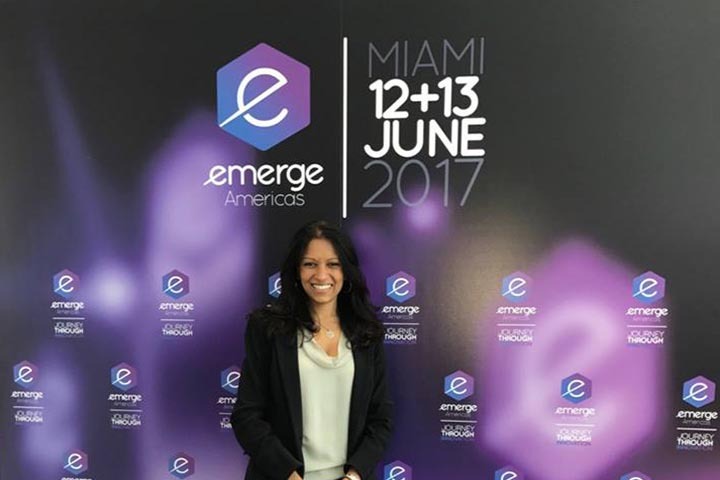 Last week I had the chance to attend eMerge Americas, the annual technology focused conference, held at Miami Beach Convention Center. Since it was my first time attending eMerge, I was excited to listen to the keynotes, the start-up pitches, and be inspired at the Women in Technology stage. EMerge did not disappoint. I met individuals committed to funding Florida emerging companies. I learned about new coding programs for children and software to help with food truck ordering. The speakers all contributed to the atmosphere of entrepreneurship and exposed the audience to expand our minds and learn. Armando Perez, (i.e. Pitbull), shared the stage with Suze Orman to tell his story why he is leading the next generation with lessons in technology. Steve Wozniak reminded us of the early challenges that he and Steve Jobs experienced in the pre-digital age. Roni Abovitz of Magic Leap revealed as much as he could about the company’s mixed reality product. As I found myself trying to digest the meaning of “spatial computing powered by a digital lightfield” and wonder what exactly Magic Leap will create, Mr. Abovitz sparked a conversation by stating that entrepreneurs must be committed to ethics. He encouraged the audience to operate with an “inner ethical path.” “We are people first. Everything is about amplifying you, not replacing you.” So, I began to wonder – does an entrepreneur face more difficult and arduous ethical issues in business due to the mere fact that she is launching an entirely new product or concept into the marketplace? If you compare a startup company managed by an entrepreneur and a small staff to a traditional corporation, there are significant differences that could lead to ethical lapses and oversight. Though one would hope that the leader of any entity makes the best and ethical decision every time, it is likely that this is not always the case due a whole host of pressures and realities facing the potential success of the budding company. Not to mention the myriad of cultural values and marketplaces that influence decisions across the globe. A large corporation that has been operating for many years and has hired a Corporate Compliance Officer (CCO) with a budget and monitoring authority and dedicated staff can strive in an organized manner for ethical compliance, or at least seek to do so. Yet, startups have no similar framework within which to address ethical issues in business and challenges. The entrepreneur herself is likely overwhelmed with her many roles at the company and has minimal time to dedicate to monitoring the behavior of her team and the company as a whole. Her energy is focused on ensuring profitability, creating corporate culture, hiring efficient staff and leaders, marketing and more. Her team members likely also have multiple roles, each carrying a heavier load then normal in order to kick-start the company forward. When an entrepreneur is embarking on a startup concept, she is trying to launch a product into the market and she must determine whether she will seek funding from private equity or government research and development grants. So should the entrepreneur develop a product or new technology that will succeed in the private marketplace? Or should it specifically target its product development in order to get government grants? When a company is being funded by private equity, the agreement for funding will usually include some level of performance requirements or reporting. The entrepreneur could face the ethical issues in business of fudging his data or product development update if she hasn’t quite reached the goal. Consider the consequences. If she believes she will make it up in the next quarter in terms of data or performance, and she does not want to lose her funding, she must make a choice. Herein lies a serious challenge. Practically, the pressures facing the entrepreneur are formidable, but she must find her “inner voice” and make the best possible decision that she can every time, no matter the consequence. I call this Ethical Vigilance. (see my Tedx Talk). An entrepreneur decides to start a new company because she believes in her concept for a new product or service or technology. There is passion and commitment to the idea and a never-give-up attitude to learning and fighting through what others might perceive as a failure. It takes courage and strength to stand-up and forge a path for a new idea. It takes serious sacrifice of time and money and energy which all takes away from an entrepreneur’s family and friends. But, along the way pressures mount and company owners might see shortcuts or fast-track methods to achieve the same success, not recognizing that a bad ethical decision is about to be made. Ms. Dunham continues to share that when we consider large multi-national corporations such as Apple, Ben & Jerry’s, TOM’s shoes, and Wal-Mart, it is clear that values based leadership created these global companies that have significantly influenced people locally, nationally, and internationally. An entrepreneur has the power to shape and shift the paradigm in ethics and community service through her leadership. Through her vision, an entrepreneur is creating new products, concepts, technologies, or services and creating demand in a new market. “Such firms not only exercise tremendous economic power but also symbolic power as they become the role models for the next generation of organizations,” Ms. Dunham states. Rony Abovitz shared last week that entrepreneurs must maintain an “inner ethical path” as they become trailblazers and inspire the next generation. Entrepreneurs face uphill challenges and, certainly, leading our communities with values based leadership, being keenly aware of some of these pressures and a focus on ethical issues in business might help these creative thinkers achieve their dreams. Posted by online marketing company, The Bart Organization. Way to go Rashmi. Very proud of you. At a real estate conference at MGM hotel in Vegas and saw the women’s conference on the hotel schedule. I passionately share your conviction to maintain the highest ethical standards in my real estate career. Coincidentally, I attended U of Miami… in post college years l experienced employment opportunities with principal’s of the firms who were involved in questionable practices. In retrospect it was the right choice and though it’s been a longer road as an entrepreneur I am thankful that honest achievement through education, self reflection and continued self improvement will get you there. It may appear to be old school but young minds need this kind of influence! Thank you Rashmi for sharing. Thank you so much Lisa for your comments and your kind words!!! It was an absolute pleasure to share at the Women’s Conference and I am very encouraged by your decision to fight for ethical vigilance! Keep it up and thanks again for your comments! This was a very insightful and accurate piece. I must admit, being an entrepreneur in the past, I’ve definitely been faced with each oif these ethical hurdles. It’s important to highlight these, as you have, because they can be a huge stumbling block to any entrepreneurs – especially new ones.